Hakka constitutes a cultural group which has uprooted itself many times and relocated as “guest people” in different parts of China, mostly around the Fujian area. As time passed, this group developed its own signature approach to boxing. 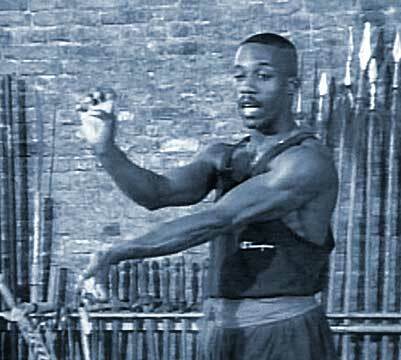 This method is clearly laid out in this DVD, working from basic training such as foot patterns, to hand formations and strikes, such as sword finger hand and phoenix fist. The boxing footwork section is presented first. Here, the camera work is so tight that during the first minutes of Sifu Rea’s demonstration you cannot even see his head, just his body and feet. I assume this was purposeful, directing your attention downward, but the effect is a little odd. 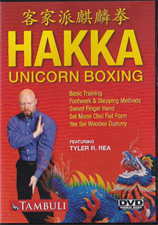 From there, he goes on to break down a crucial form in the Hakka style, Unicorn Boxing. This section is straightforward, very clear and easy to learn from his presentation. Lastly, he applies blocks and strikes to a wooden dummy, always a welcome example. However, I found the extreme simplicity of the movements to be a bit disappointing. Rea shows progressive patterns where each move furthers a step before starting a new pattern. This DVD lays out the style with no showboating whatsoever. Each movement, in the air or against a “dummy,” is shown in solo form, just Rea himself with no partner. You can find it all in this DVD. 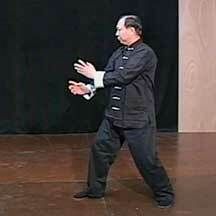 Sifu Kwong Man Fong is a direct lineage holder of the Bak Mei system. In this short but packed 30 minute DVD he shows the famous and fundamental Sup Jee form with both he and his top student demonstrating (a vivid version). In addition applications, exercises for training, and Bak Mei's particular Chi Kung are all explored. A good representation of a well known but hard to find system. More about Bak Mei style... NTSC: About 30 minutes. Five Ancestors Boxing, founded by Sijo Chua Giok Beng, combines hands from the White Crane, footwork from the LuoHan, evasions from Tai Hsing Monkey, light techniques from Tai Tzu and Iron Body work from Boddhidharma method. FAB was designed to be simple but effective. This DVD shows the essence of the FAB system including many of its important guiding principles. Tu: spit, Tim: Sink, Tun: swallow, Pu: float. Mr. Paman’s presentation here is very concise and logical with short but well constructed sections. Using Key Words is a very interesting way to cross reference the entire system. Among forms is an advanced version of San Chin known as Tien Te Chien (Heaven and Earth War form). This form shows the obvious influence of Crane Boxing. 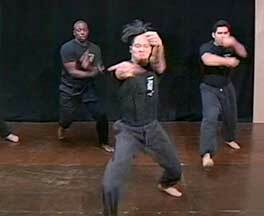 Next is See Mun Pa Kat (Hitting the Four Gates) which has a number of advanced FAB principles and movements. Again the connection to Crane Kung Fu is crystal clear. Panam Sifu shows full breakdowns in both cases. The DVD finishes with short and sweet applications all in the FAB mode. Overall Mr. Panam’s presentation is well paced and very considered, no rushing through the information. Mr. Panam has been practicing Ngo Cho for over 30 years and is also expert in arnis, karate and jiujitsu. He was voted the Inside Kung Fu "Writer of the Year" in 2007. See his book on Ngo Cho. Backgound information on this style. 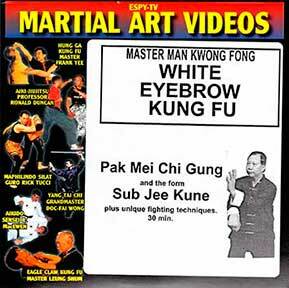 NOTE: Bak Mei is Cantonese for White Eyebrow (Bai Mei). This DVD is a work of intense interest in the subject. It shows ShihFu Li Yang Jian ( a student of the very active Lau Xiu Luang) of Fu Shan City. Michael Coconis and Dr. Gar Won Ko help with narration and instructions. The basic set, Sup Gee, is shown over and over from different angles and with different speeds. Bak Mei energy is likened to that of the Tiger blending hard and soft. Bak Mei is considered to be relatively easy to learn before one sees results. It is highly efficient and very fast. 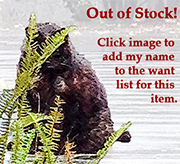 There is also some space on the tape devoted to the plight of the Tiger and the danger to the different species. This art is from the Lao Xiu Luang branch. He established the Futshan lineage of Bak Mei through Li Yang Jian. Sup Gee is considered so important that the saying goes, "If you don't know Sup Gee how can you be a Bak Mei student?" The set has 72 movements and can be performed in less than 60 seconds but it is fundamental This DVD doesn't pretend to be entirely instructional and even though the form is shown many times there is relatively little commentary. Dragon Style was said to be created by Ng Mui, the nun who taught the famous Yim Wing Chun: creator of the Wing Chun style. There are obvious correlations between the two styles: double hand usage, a conservative posture, sticky hand partner work, emphasis on quick hands, etc. Created by Ng Mui, passed to Tai Yu, then Lam Yu Kuai, next to Chou Sam and here to Yip Wing Hong. NOTE: These DVDs were made from ESPY's original video tapes and do not have all the advantages of more recent DVDs such as chapters. Basics shown such as the essentials swallow and spit, cover and sink. 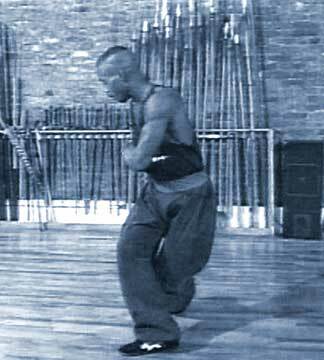 The Dragon step; walking steps with exercises (all of them shown in application) Beginning sets shown are: Sup Luk Dung "16 Moves', Sam Tung Kuen, Bic Bo Sam Tung and the Dragon Saber (which we notice has the first third of it being the Northern Shaolin PiGua Saber). Tight moves, elbows, counter-kicking, each form applications shown. Also Sui Doi Chuk or "Position Sparring": the beginnings of Dragon style fighting. Intermediate drills include: Stance work, Push Hands, Three Stars, Partner Nei Gong, and basic hand techniques. Sets shown are: Lung Ying Ying Chow "Dragon Style Eagle Claw", Lung Ying Mor Kiu "Dragon Style Rubbing Block" (See book on this) and the Double Butterfly Knives. Applications are shown for everything in the form. A large section on basic self defense techniques.